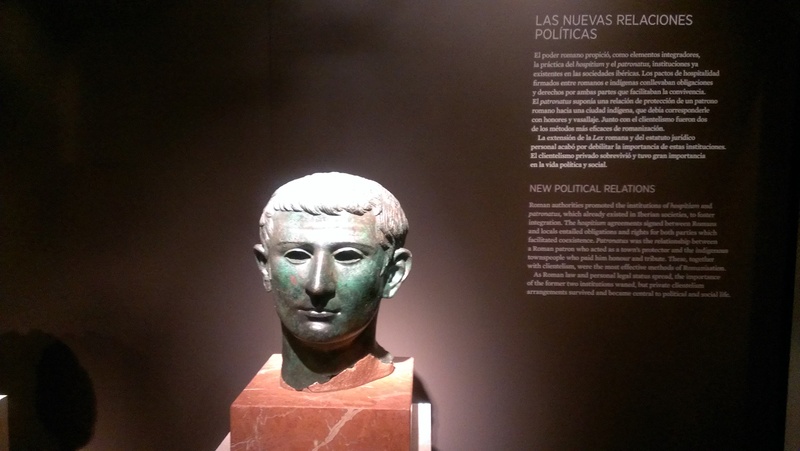 A couple of days ago I was lucky enough to visit the newly refurbished National Archeological Museum in Madrid and, I say lucky, because I was gladly surprised to see that, for once, taxpayers’ money was not wasted. 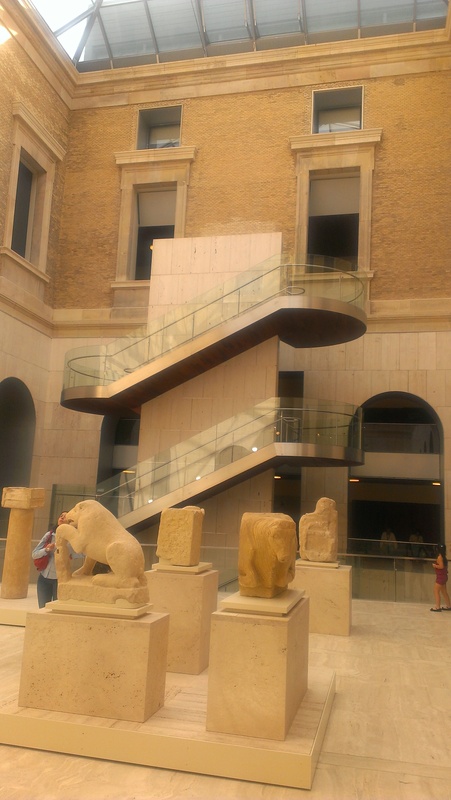 The result after six years and 65 million Euros, a work performed by architect Juan Pablo Rodríguez Frade, has given Madrid a new jewel to its already large cultural treasure. The sciences of Archeology and History have gained a new center for research, study, divulgation and entertainment, all under the same roof. The MAN was partially closed in 2008 and completely in 2011 to give it its first major lifting in four decades, it was indeed due for a change. 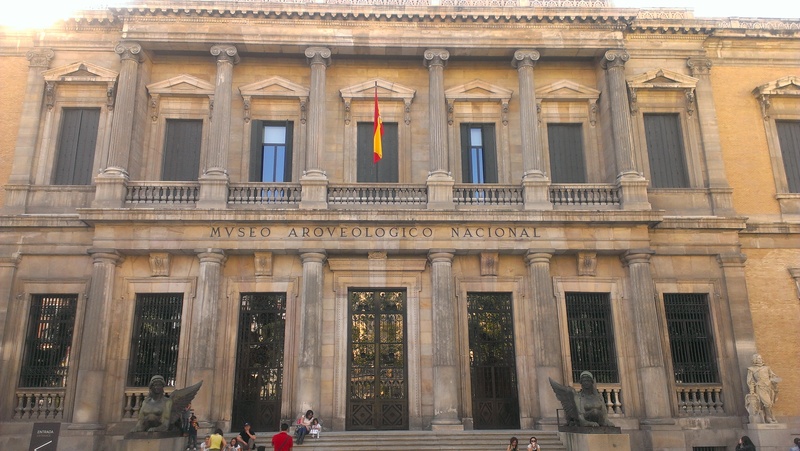 The building, of neoclassical style, built in the second half of the XIX century and shared with the National Library, was showing signs of fatigue and the exhibitions were antiquated and repetitive, overloaded with material from its immense heritage. Finally, on the 1st April, the doors of this cultural institution reopened to let the throngs of people who wanted to see it, taking advantage of the free entry during this month. The response has been quite positive. The surface available for exhibitions grew by more than 30%, from 7,300 square meters to 9,715, although the number of pieces shown went down from eighteen to thirteen thousand. I personally don’t see this reduction too negative, for I think that it is not necessary to see hundreds of pieces of Greek ceramics to admire their beauty and understand their importance nor I wish to spend hours walking down the rooms packed with repetitive items. I am fine with a few dozen. Outside, the façade barely changed and only its wall were scraped to bring out the old and natural beauty of the stone, but in the inside, the transformation has been total. To begin with, the new lobby is wide, well lit and takes very well advantage of the original marble floors. As in all modern museums, there is an information center with qualified staff handing out free maps and organize guided visits, with audio devices for those who demand them. The entrance itself is in one of the roofed interior yards and, even though there is a large crowd, there are no lines inside (however, when I left, I saw an enormous line outside). One of the main changes resides in the layout of a clear “path” through the exhibit, somewhat like that in IKEA that takes us around all the rooms although instead of low-cost design furniture we find the maps, history and gadgets of our ancestors. 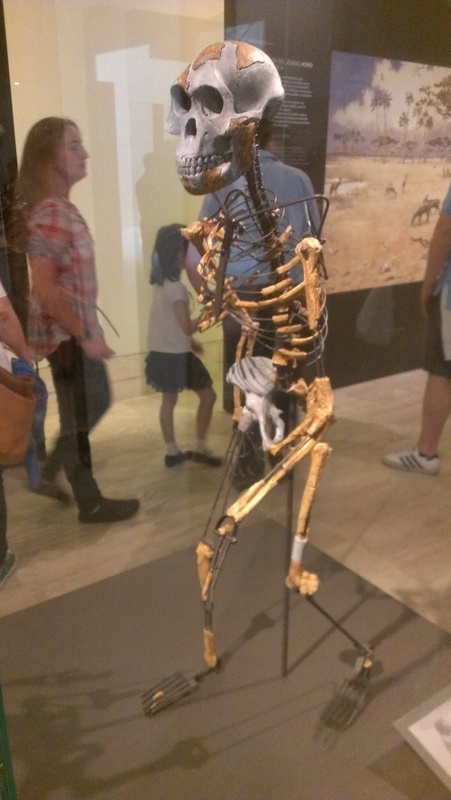 In addition to the display cabinets full of bones, flint tools, coins and reconstructions, all along the way there are large flat screens continuously playing videos with images and texts easy to follow by adults and children. The latter, a considerable percentage of the public, their big pop eyes and their good behavior give away their fascination with the exhibit, enough to be optimistic about the future of these sciences. 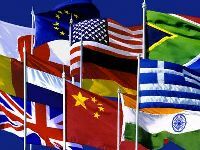 On several occasions, I witnessed how little people of eight to ten years-old inquired their parents over the various eras dealt with in the visit, their peoples and traditions. The signs and labels are written with easy-to-read and large fonts, something appreciated by those who occasionally need help for our tired eyes. I did not have to use my glasses at all. One more detail, pictures can be taken, without flash, of course. (I didn’t know this in advance, so forgive me for the low quality of the pictures, a problem I will solve soon). 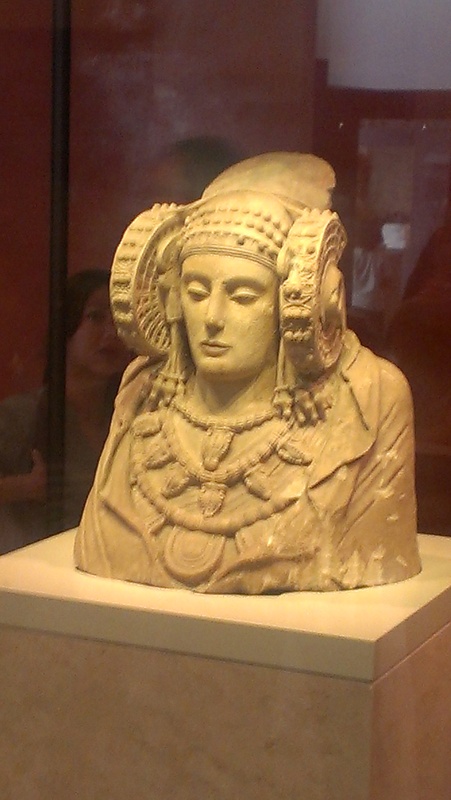 The museum boasts several treasures, among which we can stand out the undeniable queen of the collection, “The Lady of Elche”, the sculpture of a puzzling woman carved in limestone around 2,500 years ago by one of the many Iberian tribes who lived in pre-Roman Spain. Another jewel is a block of stone carved with the likeness of a tribe chief in the Bronze Age, the so called “Estela de Solana de Cabañas”, named after the region of the Caceres province where it was found. 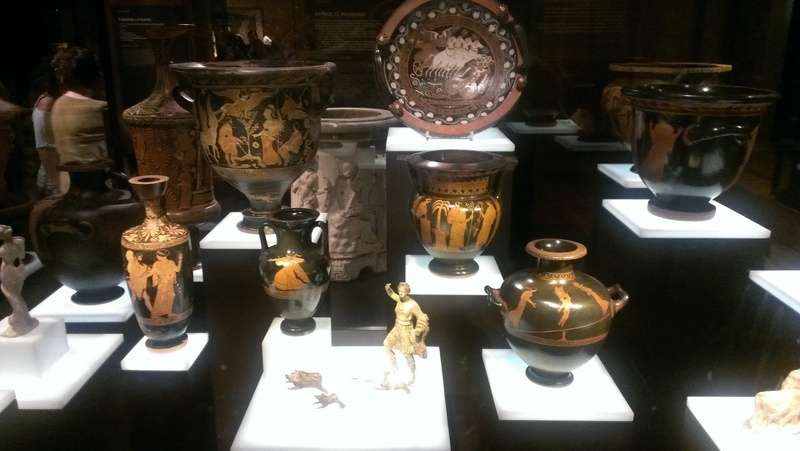 I liked the catalog of Greek ceramics, jars, amphora, plates, trays; all decorated with the classic Hellenistic art, with human and animal figures telling the stories of titans, heroes, gods and other characters in mythology. Last, the extraordinary coin collection spanning the whole history of money and which, even after losing a good deal in the Spanish Civil War, it still boasts quality and beauty. Without spending too much time in the details, it took me two and a half hours to do the whole museum, although I honestly think I will need a couple more of visits to grasp its majesty in its entirety. I did not finish exhausted, but captivated by the show and the new facilities. I do not know how children fared and if anyone has got such an experience I would appreciate they let me know. In any case, I am planning to pay the museum a visit every time I have the chance, I am sure I will always discover and learn something new. Natives and tourists alike, rejoice with the news. 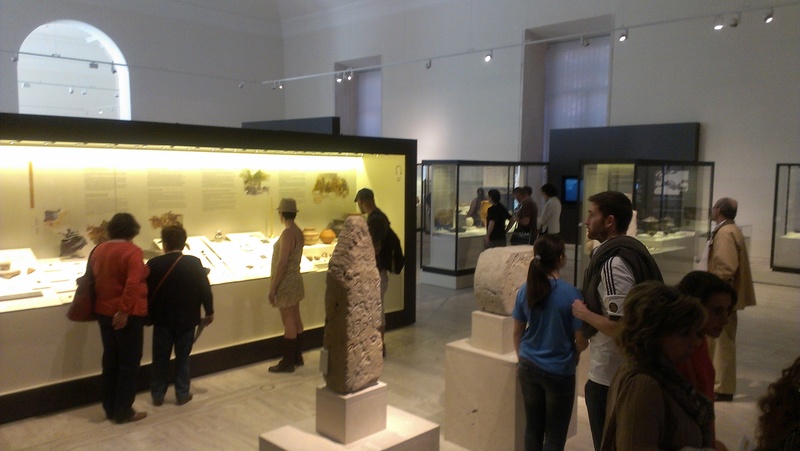 The new National Archeological Museum has reopened its doors and has reached the vanguard of museum studies art with its new facilities. I highly recommend all those who are lucky enough to visit our beautiful capital city to delight themselves with its treasures in a comfortable, modern environment, perfectly adequate for families. I guarantee you will not regret it.